Arms of HRH Prince William, Earl of Strathearn. Earl or Mormaer of Strathearn is a title of Scottish nobility, referring to the region of Strathearn in southern Perthshire. Of unknown origin, the mormaers are attested for the first time in a document perhaps dating to 1115. The first known mormaer, Malise I, is mentioned by Ailred of Rievaulx as leading native Scots in the company of King David at the Battle of the Standard, 1138. The last ruler of the Strathearn line was Malise, also Earl of Caithness and Orkney, who had his earldom forfeited by King Edward Balliol. In 1344 it was regranted by King David to Maurice de Moravia, a royal favourite who had a vague claim to the earldom as Malise's nephew and also stepfather. Strathearn has since been used as a peerage title for James Stewart, an illegitimate son of King James V of Scotland, who was created Lord Abernethy and Strathearn and Earl of Moray in 1562. In 1631, William Graham, 7th Earl of Menteith was confirmed in this dignity as heir of line of Euphemia Stewart, Countess of Strathearn (d. 1415), but was forced to settle for the less prestigious title of the Earl of Airth in 1633. It has also been granted to members of the royal family in the titles of Duke of Cumberland and Strathearn (created 1766, extinct 1790), Duke of Kent and Strathearn (created 1799, extinct 1820) and Duke of Connaught and Strathearn (created 1874, extinct 1943). 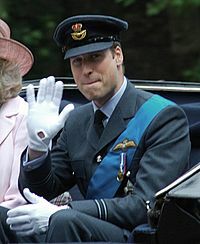 On 29 April 2011, the title was recreated when Queen Elizabeth II conferred the title on Prince William of Wales. As a result, on marriage his wife Catherine became Countess of Strathearn. He generally uses this title in Scotland. ^ "Titles announced for Prince William and Catherine Middleton" (Press release). Clarence House. 29 April 2011. Archived from the original on 3 October 2013. Retrieved 2 August 2013. ^ Rayner, Gordon (2 August 2013). "Duchess Kate: Princess of the United Kingdom (but you can call me mummy)". The Daily Telegraph. Archived from the original on 20 August 2013. Although she has never used the name, the Duchess is entitled to refer to herself as Princess William of Wales, as well as being Countess of Strathearn and Lady Carrickfergus. This page was last edited on 9 April 2019, at 18:02 (UTC).